Exercise-Induced Collapse (EIC) is an inherited neuromuscular disorder that affects several breeds of dogs. EIC presents as exercise intolerance in apparently healthy dogs. Affected dogs are usually diagnosed before two years of age and appear normal during low to moderately strenuous activity. However, shortly after 5-20 minutes of strenuous exercise affected dogs will begin to walk with a wobbly, uncoordinated gait that often only affects the hind limbs. Dogs remain mentally alert and are not in pain during episodes of EIC. In some circumstances, the symptoms of EIC can progress to full body weakness with low muscle tone (flaccid paralysis), confusion, loss of consciousness, seizures and very rarely, death. The episodes typically last 5-10 minutes and most dogs will completely recover within 15-30 minutes. Cardigan Welsh Corgi is included as a breed susceptible to exercise induced collapse because of its close relatedness to the Pembroke Welsh Corgi breed, which is known to develop this disease due to Mutation of the DNM1 gene. The frequency of the causal mutation or association with disease in this breed is not reported in the medical literature. Genetic testing of the DNM1 gene in Cardigan Welsh Corgis will reliably determine whether a dog is a genetic Carrier of exercise-induced collapse. Exercise-Induced Collapse is inherited in an Autosomal Recessive manner in dogs meaning that they must receive two copies of the mutated gene (one from each parent) to develop the disease. In general, carrier dogs do not have features of the disease but when bred with another carrier of the same Mutation, there is a risk of having affected pups. Each pup that is born to this pairing has a 25% chance of inheriting the disease and a 50% chance of inheriting one copy and being a carrier of the DNM1 gene mutation. Reliable genetic testing is important for determining breeding practices. 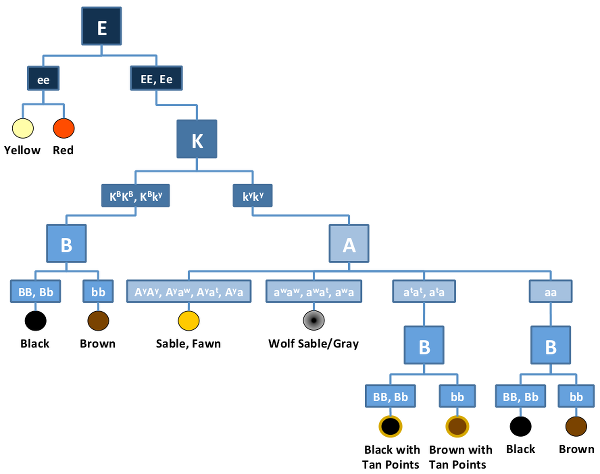 Because this mutation shows Variable Expressivity, genetic testing should be performed before breeding. In order to eliminate this mutation from breeding lines and to avoid the potential of producing affected pups, breeding of known carriers to each other is not recommended. Cardigan Welsh Corgis that are not carriers of the mutation have no increased risk of having affected pups.